The United Nations and its global network of information centres held special events throughout the world to mark the 2016 International Day of Remembrance of the Victims of Slavery and the Transatlantic Slave Trade (25 March) under the theme “Remember Slavery: Celebrating the Heritage and Culture of the African Diaspora and its Roots”. The theme draws attention to the rich African culture and traditions that have impacted life in countries that were involved in the slave trade and where the African Diaspora continues to make major contribution in all aspects of life. It also highlights the cultural linkages that exist among people of African descent throughout the world. Events at United Nations Information Centres (UNICs) and a United Nations peacekeeping operation to honour the victims of slavery and the Transatlantic Slave Trade ranged from film screenings and cultural performances to historical exhibits and panel discussions. The United Nations Remember Slavery Programme provided field offices with educational materials. More than 70 activities were organized in 24 countries to celebrate the heritage and culture of the African Diaspora. On 12 April, some 300 students from the University of Ghana and the Tema Community ‘7’ Basic School participated in a student forum organized by UNIC Accra, in collaboration with the Central University and Abibimman Foundation, to mark this year’s International Day. The interactive session included a lecture from archaeology professor James Kwesi Anquandah followed by questions and answers; a reading of the message from the Secretary-General; and a play about slavery and the Transatlantic Slave Trade. A minute of silence was observed with each participant holding a lit candle in remembrance of the victims. 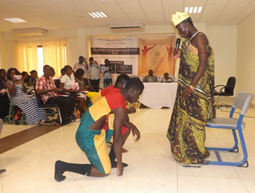 A representative of the UNESCO office in Ghana participated. A 5-day exhibit on “Africans in India: From Slaves to Generals and Rulers” was opened with drumming and dancing by the Tema Community ‘7’ Basic School. There was also a screening of the documentary film “Queen Nanny: Legendary Maroon Chieftainess”, which was attended by students from the University of Ghana. On 23 March, UNIC Antananarivo organized a one-day conference focusing on Africans in India, which included the screening of a documentary on people of African descent, a presentation on Africans in India by a history professor and a question and answer session. There were also performances by students, which included a presentation on why Africans in India were different from slaves in other countries. The Secretary-General’s message for the International Day was read aloud by a UNIC staff member, who also shared impressions of her recent visit to Senegal’s Gorée Island, the site of a museum and memorial to victims of the Transatlantic Slave Trade. The “Africans in India: From Slaves to Generals and Rulers” exhibit was displayed both at the UNIC and Estiim University. UNIC Antananarivo also organized a screening of the film “Queen Nanny: Legendary Maroon Chieftainess” on 13 April. 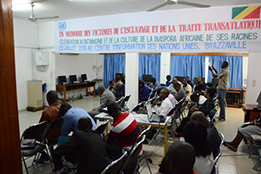 UNIC Brazzaville held a conference on 22 July on the political and cultural contributions of the African diaspora throughout the world. The screening of the film “They Are We” preceded an academic presentation by a history teacher at Marien Ngouabi University. Eighty participants, including students and members of the media and civil society, attended the outreach activity, which featured a lively discussion and was organized in connection with the International Day of Remembrance for the Victims of Slavery and the Transatlantic Slave Trade. 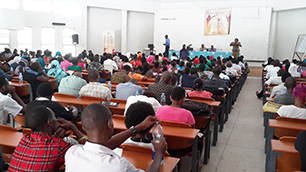 On 25 March, UNIC Bujumbura organized and hosted a student briefing to commemorate the International Day. The event featured a lecture based on the Secretary-General’s commemorative message. Students saw and discussed the film “Coeur de Lion”. The UNIC also hosted a screening of the film “Queen Nanny; Legendary Maroon Chieftainess” and displayed the exhibit “Africans in India: From Slaves to Generals and Rulers” on subsequent dates. UNIC Dakar participated in a special programme on slavery on the popular Senegalese television talk show “Impressions”. 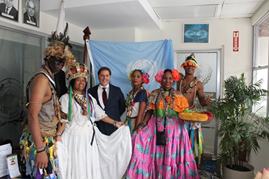 During the programme, UNIC Director Damian Cardona-Onses explained the work of the United Nations Remember Slavery Programme and shared information about The Ark of Return, The Permanent Memorial to Honour the Victims of Slavery and the Transatlantic Slave Trade at the United Nations. UNIC Dar es Salaam observed the International Day on 30 March at the Mwalimu Nyerere Memorial Academy in Dar es Salaam’s Kigamboni area. More than 500 students participated in the event, which featured a screening of “Queen Nanny: Legendary Maroon Chieftainess”. The students heard a presentation and then engaged in discussions on the film’s themes and how they related to Tanzania. The exhibit “Africans in India: From Slaves to Generals and Rulers ” was translated into Kiswahili and displayed. After touring the exhibit, many students said they could relate to the exhibition and connected the historical information contained in it with the presence of Indians in Tanzania -- especially in the coastal towns in the country's east. The Secretary-General’s statement for the Day was read out by the UNIC’s information officer, flyers were distributed, and media interviews were conducted via print, radio and television. A social media campaign in Kiswahili and English was also encouraged using the following hashtags: #kumbukautumwa and #RememberSlavery. The UNIC also shared a poster advertising The Ark of Return, The Permanent Memorial to Honour the Victims of Slavery and the Transatlantic Slave Trade, with the National Library in Dar es Salaam. On 11 April, UNIC Harare commemorated the International Day by displaying the exhibit “Africans in India: From Slaves to Generals and Rulers” and screening “Queen Nanny: Legendary Maroon Chieftainess”. Participants included students from four universities, members of the diplomatic corps and lecturers. During the exhibit opening ceremony, representatives from UNIC Harare provided the audience with background of the International Day. The keynote address was delivered by Gideon Gapare, Deputy Director of Multilateral and Political Affairs in the Ministry for Foreign Affairs of Zimbabwe, on behalf of David Hamadziripi, Director for Multilateral Affairs in the Ministry for Foreign Affairs. 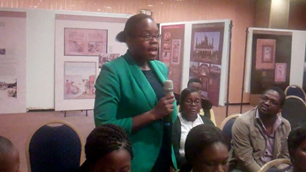 The documentary film was followed by a discussion moderated by UNIC Harare and involving students and their lecturers. Copies of the Secretary-General’s commemorative message were distributed in English, Ndebele and Shona. The event was covered by the local media, including the radio stations Star FM and Zi-FM. Activities marking the International Day were held at Southfield Academy in the Bariga area of Lagos, included a screening of the film “Queen Nanny: Legendary Maroon Chieftainess”; the display of the exhibit “Africans in India: From Slaves to Generals and Rulers”; a briefing and quiz on The Ark of Return, The Permanent Memorial to Honour the Victims of Slavery and the Transatlantic Slave Trade at the United Nations; and a WebEx online meeting with students in Accra and Nairobi. UNIC Lagos Director Ronald Kayanja read out the Secretary-General’s message for the 2016 International Day. UNIC Lomé partnered with the Federation of UNESCO Clubs to organize and host the screening of the film “Queen Nanny: Legendary Maroon Chieftainess” on 6 April as part of this year’s commemorative activities. Prior to the screening, a history professor delivered a presentation about the history of the Transatlantic Slave Trade. 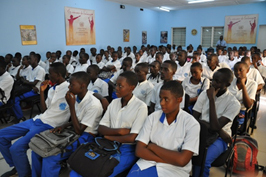 Both events were attended by more than 300 secondary school students who are members of UNESCO Clubs in Lomé. Students also visited an exhibit of slavery-related photos and historical documents entitled “Mediathèque Jean-Paul II”. 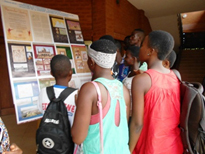 On 29 April, 160 students from 18 secondary schools visited the Wood Home, also known as the Maison des esclaves (Slave House) in the city of Agbodrafo, which is 35 kilometres outside Lomé. During the two-hour visit, students were briefed on the history of the site and how slaves were treated. On 25 March, UNIC Lusaka joined the UNICs in Accra, Lagos and Nairobi, to host a WebEx online meeting. Participants included university students, college lecturers, media representatives and experts in the field of slavery and human rights. 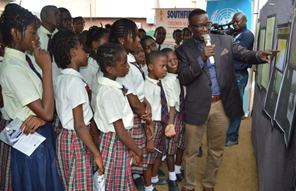 UNIC Lusaka also organized an outreach activity in the central Zambian town of Kabwe in partnership with Youth Destiny, a local non-governmental organization (NGO). Participants saw two films – “The Batwa People” and “Queen Nanny: Legendary Maroon Chieftainess” – and then held a discussion and question and answer session. 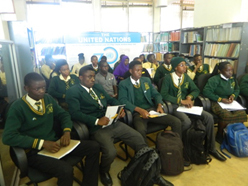 Students asked how the United Nations was helping to reduce and stop discrimination of Africans around the world and discussed the transfer of African culture and technology to the Americas during the Transatlantic Slave Trade. Other activities included the sending of 2 bulk text messages to 15,000 people countrywide and the distribution of 5,000 pamphlets on slavery and the 2016 theme. There was media coverage by The Post Newspaper, Times of Zambia and a local radio station in Kabwe. 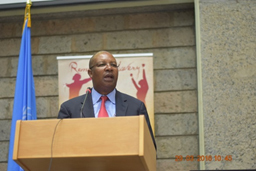 On 29 March, UNIC Nairobi organized a panel discussion to observe the International Day. More than 300 students from 16 local universities engaged for more than two hours in discussions on the role of Africans in the Transatlantic Slave Trade and the impact of the Transatlantic Slave Trade on African societies today. 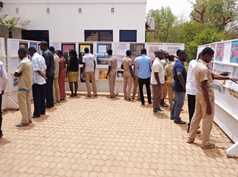 In partnership with the University of Ouagadougou, UNIC Ouagadougou hosted lectures on slavery and the Transatlantic Slave Trade in 10 high schools on 25, 28 and 29 March. Some 3,500 students and teachers participated in these lectures. The UNIC displayed the exhibit “Africans in India: From Slaves to Generals and Rulers” from 25 to 31 March. Approximately 3,800 people visited the exhibit, including Government officials, students, diplomats, researchers, members of civil society and media representatives. On 25 March, the UNIC screened “Queen Nanny: Legendary Maroon Chieftainess”. Before the screening, which took place in a packed auditorium, the Secretary-General’s message for the International Day was read aloud. 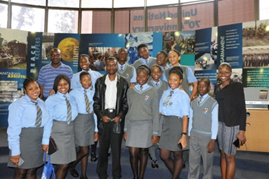 UNIC Pretoria organized and hosted an event on March 17. More than 70 members of the public and schoolchildren, including from the Katlehong area east of Johannesburg, participated. The event was marked by poems, music and key messages about how slavery impacted the African way of life. A student from Founders Community School recited a poem about African heritage and the ills of slavery. The documentary “The Middle Passage” by renowned Hollywood director Steven Spielberg, which is based on the history of the Transatlantic Slave Trade, was screened. Musical group “Mosaic” entertained guests with African-inspired tunes. Acting UNIC Director Maureen Nkandu said, “This is a history we dare not forget, for it still has a bearing on how the African or the black person is perceived and treated today”. Zolani Mkiva of the African Delphic Council gave the keynote address. 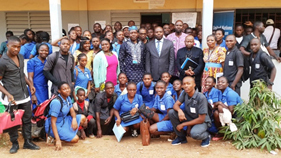 UNIC Yaounde organized an educational outreach event to commemorate the International Day at the Lycée de la Cité Verte (Government High School) in Yaounde on 7 April. The event was designed to increase students’ awareness of the rich African culture and traditions that have impacted life in the countries that were involved in the Transatlantic Slave Trade. The film “Queen Nanny: Legendary Maroon Chieftainess” was screened and followed by a panel discussion. Panellists included representatives of the UNIC and UNESCO. Copies of the Secretary-General’s commemorative message, background information on the 2016 theme and the Transatlantic Slave Trade, and a brochure on The Ark of Return, The Permanent Memorial to Honour the Victims of Slavery and the Transatlantic Slave Trade at the United Nations, were distributed to participants and the media. 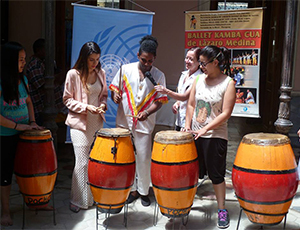 On 15 December, UNIC Asunción – in cooperation with the Cabildo Cultural Centre Network – held a workshop on African rhythms and cultural heritage that was attended by more than 40 participants, including educators, students and artists. Speakers, including from the Paraguayan Network of Afro-Descendants and the Catholic University, lectured on the history of Black communities in Paraguay, and the UNIC explained the legacy of the transatlantic slave trade. The Kambakua Ballet taught participants how to dance to African rhythms and play African drums. The UNIC distributed educational materials on the transatlantic slave trade and African cultural heritage, and the event was covered by the media. On 17 October, UNIC Mexico -- in cooperation with the Jamaican Embassy in Mexico and the Mexican Foreign Ministry -- screened the film “Queen Nanny: Legendary Maroon Chieftainess" at the Cineteca Nacional in Mexico City. The screening was part of a larger event that focused on Jamaican national heroes. UNIC Director Giancarlo Summa attended on behalf of the United Nations. A second screening was held on 10 November at the National Institute of Anthropology and History. 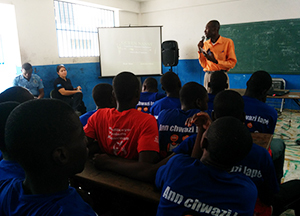 The United Nations Stabilization Mission in Haiti (MINUSTAH) organized a screening of the documentary “Queen Nanny: Legendary Maroon Chieftainess” for nearly 100 young detainees at Haiti’s Centre for the Rehabilitation of Minors in Conflict with the Law (CERMICOL) on 29 August 2016 in Port-au-Prince. Following the screening, MINUSTAH’s Communication and Public Information Office facilitated discussions among the attendees, who were between the ages of 11 and 17. The conversation focused on the need for peoples around the world to be familiar with their roots and ancestors. The young people expressed admiration for the key role played by Queen Nanny in the fight against slavery and against one of the world’s biggest armies at that time. According to one participant, “The actions of Queen Nanny can be summed up in one word: leadership… She used her leadership to drive her people to freedom”. On 8 April, UN Resident Coordinator in Panama Martín Santiago Herrero hosted an event for students from the University of Panama’s Faculty of Law and Political Science, Government officials, the diplomatic corps, the media and representatives of international and Afro-Panamanian organizations. The film “Queen Nanny: Legendary Maroon Chieftainess” was screened. The Resident Coordinator read out the Secretary-General’s message for the International Day and presented an award to Professor Gerardo Maloney Francis for his work on Afro-Panamanian culture and his efforts to promote equality and social justice for Panamanians of African descent. The exhibit “Africans in India: From Slaves to Generals and Rulers” was also displayed. Performers from “La Reina Congo” used music and dance to tell stories about the Transatlantic Slave Trade. The UNIC also ensured that the Secretary-General’s message was published in the Panamanian press. On 16 April, UNIC Port of Spain, together with the Trinidad and Tobago National Commission for UNESCO, co-hosted a screening of “Queen Nanny: Legendary Maroon Chieftainess” during an event targeted at young adults. 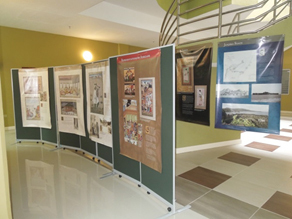 The UNIC also mounted the “Africans in India: From Slaves to General and Rulers” poster exhibit, hosted an information table and disseminated Remember Slavery promotional materials (posters, postcards, bookmarks and Ark of Return brochures) to attendees. UNIC Port of Spain also coordinated the hosting of the “Africans in India” exhibit by the Scarborough Library in Tobago and production of Remember Slavery promotional material for dissemination to exhibit visitors and other library users there. The exhibit lasted from 2 to 27 May. The UNIC also hosted 15 students who participated in the 8th Annual United Nations 'Remember Slavery' Global Student Videoconference, which brought together students from Dakar, New York and Port of Spain to discuss the theme "Celebrating the Heritage and Culture of the African Diaspora and its Roots" on 13 May. UNIC Port of Spain arranged for the students’ participation in the international event in partnership with the Trinidad and Tobago National Commission for UNESCO). ‘Remember Slavery’ printed material was also distributed to some 30 schools in Trinidad and Tobago through the UNESCO Associated Schools Project Network (ASP-Net). On 10 June, UNIC Washington co-presented a screening of the film “Queen Nanny: Legendary Maroon Chieftainess” with and at the AFI Silver Theatre in Silver Spring, Maryland, as part of the DC Caribbean Film Festival. UNIC Director Robb Skinner delivered welcoming remarks. To mark the International Day, UNIC Canberra partnered with the Faculty of Law at the University of Technology Sydney to organize a screening of the film “Queen Nanny: Legendary Maroon Chieftainess”. During her opening remarks, Jennifer Burn, Director of Anti-Slavery Australia, explained that, while the film related to a time and place quite distant to current day Australia, the film’s lessons were still relevant today. Both remarks underscored the message of the Secretary-General, which was shared with participants. exhibition entitled AFRICANS IN INDIA. 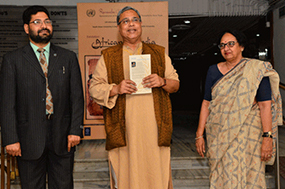 There was great interest in New Delhi in the exhibit “Africans in India: From Slaves to Rulers and Generals”. To mark the International Day, UNIC New Delhi partnered with the South Asian University (SAU) and the Department of African Studies at Delhi University to host this exhibition for 10 days in the lobby at SAU, located in Delhi's diplomatic enclave, Chanakyapuri. At the exhibit opening on 21 March, SAU President Kavita Sharma praised the intense research that had yielded such a stunning display of photographs and facts about the history of Africans in India. In addition to the students, there were over 30 scholars from the University in attendance. The exhibit also attracted great media attention with several positive articles about the exhibit being published throughout New Delhi. The exhibition was also displayed at UN House in Lodi Estate as well as the India Africa Day Gala 2016 organized by the Association of Spouses of African Heads of Missions (ASAHOM) in India. UNO Tbilisi organized a screening and discussion of the film “Queen Nanny: Legendary Maroon Chieftainess” on 2 April for students from Batumi State University. 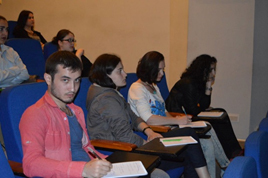 On 8 April, students from Tbilisi State University, Ilia State University, Tbilisi Technical University, the Caucasian International School and the Georgian Institute of Public Affairs, attended a one-day conference on the theme: “Celebrating the Heritage and Culture of the African Diaspora and its Roots.” This event was held at Tbilisi State University to promote greater knowledge of and respect for the diverse heritage, culture and contributions of people of African descent to the development of societies. The conference was facilitated by Flora Pachulia, founder of the NGO World Without War and member of the organization Cooperation for Peace and Progress. The poster exhibit “Africans in India: From Slaves to Generals and Rulers” was also opened in the lobby of Tbilisi State University. The conference was followed by a screening of the film “Queen Nanny: Legendary Maroon Chieftainess” at the Parliamentary Library of Georgia. These events were organized by the European Law Students’ Association-Georgia with support from the UNO Tbilisi. 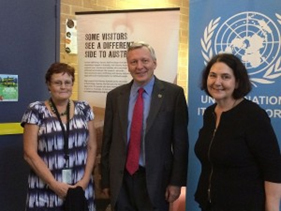 UNO Yerevan organized an educational outreach event at the UN House on 29 March dedicated to the International Day. Around 50 high school students from the cities of Gyumri and Vagharshapat attended with their teachers. Students saw the UNESCO film “Slave Route: Soul of Resistance”. The film’s beginning was subtitled in Armenian, and a summary of the film’s remainder was distributed as a handout. A lively discussion followed the screening. UNO Yerevan also delivered a presentation about slavery, the Transatlantic Slave Trade and slave routes in the Indian Ocean.